Ello, the new Facebook competitor, and social media fatigue. 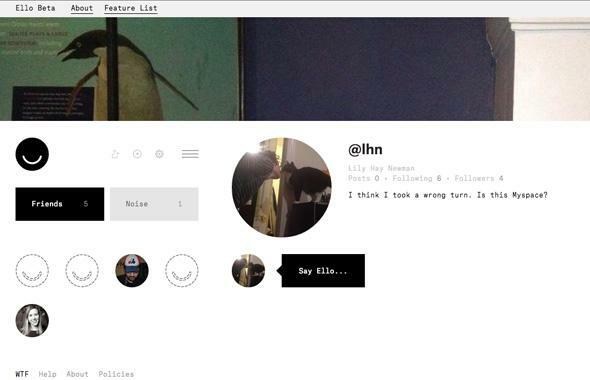 Ello is a new social network that’s been getting a lot of attention this week. It’s currently in beta, so you can join only if you get an invitation from someone else. But those invites are now hot commodities, as people start to embrace it as an anti-Facebook. Ello doesn’t force people to use their real names—which has driven its popularity in the LGBTQ community—and it promises to never serve ads. Of course we’ve heard that before, and who knows how long it will last, but Ello is trying to be serious about the no-ads thing. The WTF section says, “A social network that has ads is a social network created for advertisers, not for people. … We’re not interested in ruling the world. We think people that are motivated to do things like that have unresolved psychological problems.” Duly noted. Ello has standard features like the ability to write posts, at-mention other users, follow people’s accounts in either the “Friend” or “Noise” category, be followed by others, share multimedia, type emojis (! ), and view posts from the accounts you follow in a chronological stream. The site has an attractive design, though it’s not the most intuitive to use. Since we’ve all used other social media services, though, it doesn’t take too long to pick up on things. It’s unclear how the site will support itself as it grows, but that won’t matter if it doesn’t take off. And will it take off? All I can say is that if you all want to be on Ello, I’ll go, too. It’s tough for me to be excited about a new social network that seems mostly similar to the old ones. I like Ello’s stance on ads if the founders can find a way to sustain it, but I don’t care that much. Also, part of Ello’s appeal is supposed to be an emphasis on design and visual art, but that’s not really something I’m looking for in a social network. So since I interact relatively infrequently, the most important thing to me about social media is just being where everyone else is. I want to hear from smart and interesting people (my friends and others), and I want them to have the opportunity to hear from me if I ever do have something to say on a social platform. I want to be able to stalk people I haven’t seen in years. I want to know what’s going on with everyone’s pets/babies. But in terms of features, I basically have social media fatigue. Wherever you all want to be is fine. I’m just in it for the otter videos.